After we posted some videos and our CAD part of the feedback we got was people asking us about our collector choice. We liked the passive collector for it's simplicity but we understood why an active collector would help. 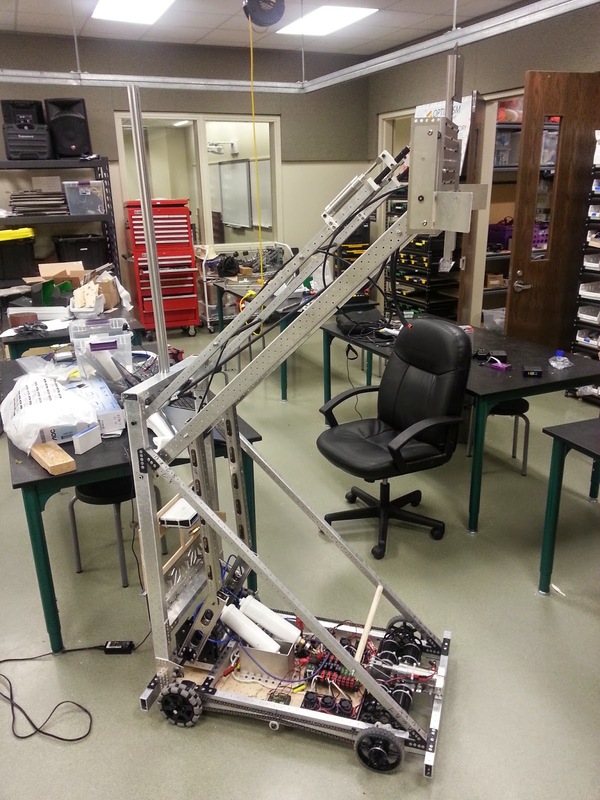 The last two days we prototyped an active collector for our robot. We got it working tonight. We also received our powder coated parts back today. Mechanical assembly will be begin in earnest very soon. 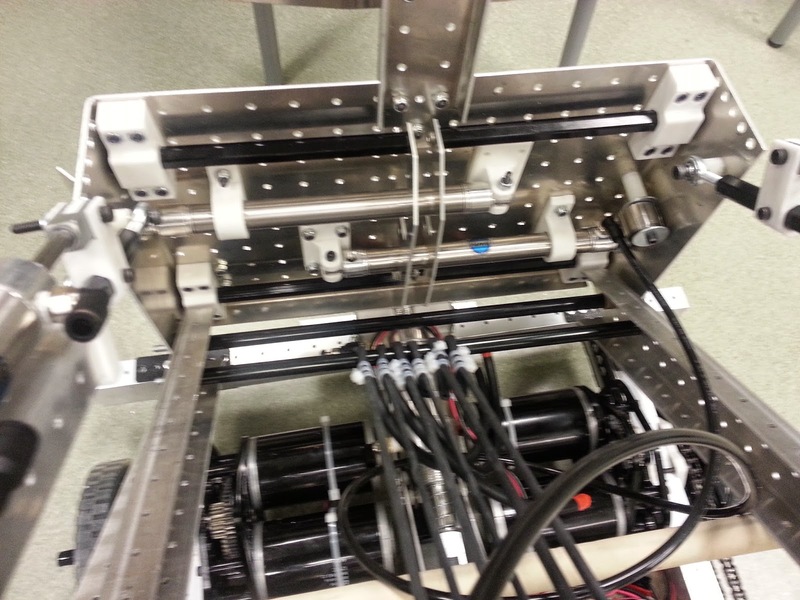 We started electrical assembly of the competition robot today. The belly pan is baltic birch plywood with a 1/32" piece of acetal on top of it. 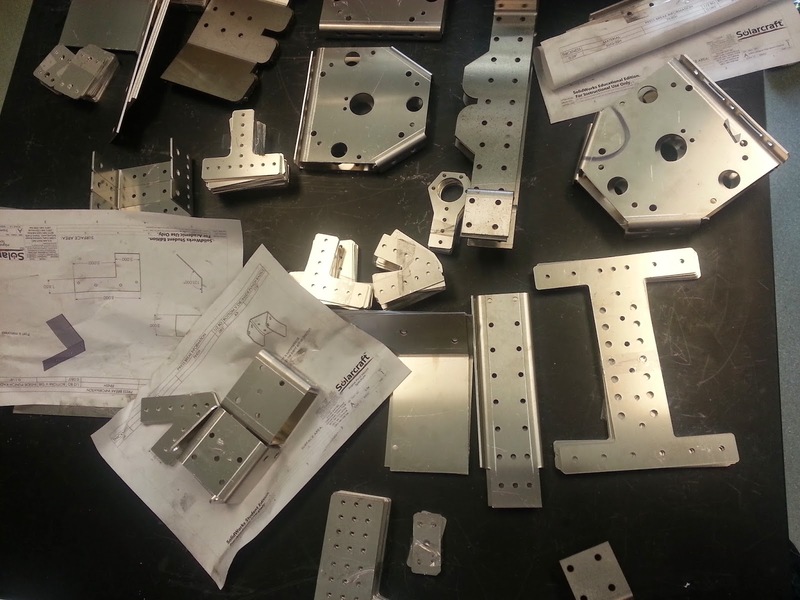 Here are a few other photos from robot construction. 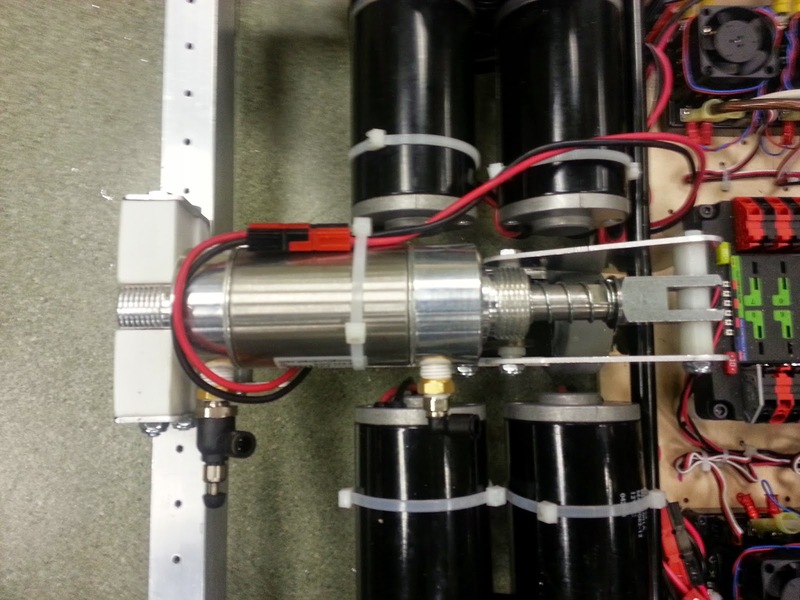 We finally got our cylinders in place for most functions today. We ran out of time to be able to drive test but that should be going quickly tomorrow. 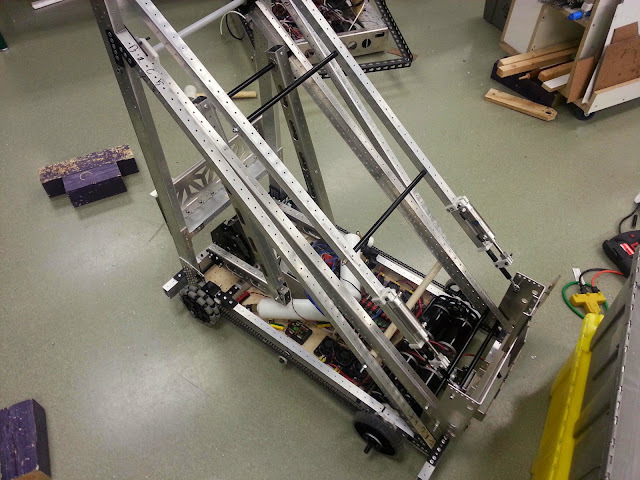 Here's the full robot as it currently stands. It reaches the full 78"
Here is a close up of the collector as it currently sits on the robot. The wedges expand to grab a tote from the wide or narrow sides. 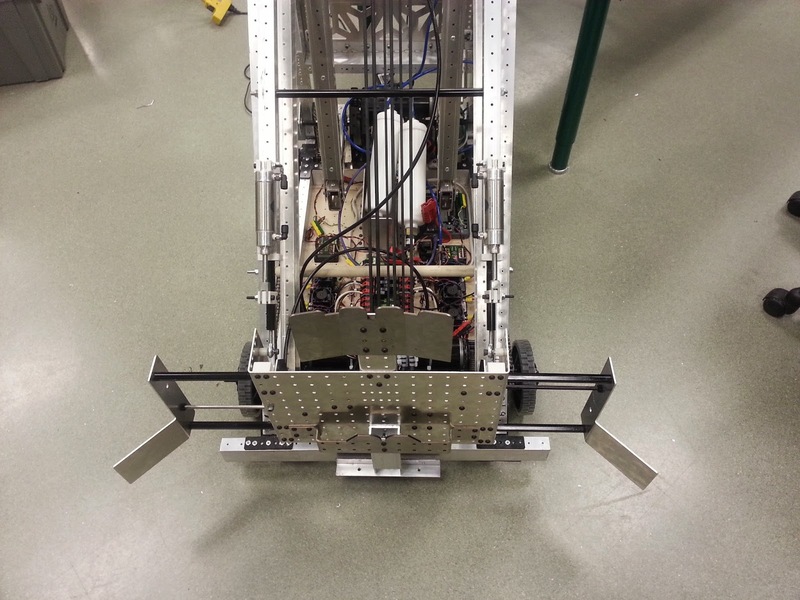 After putting it together and just pushing the robot around we identified several areas of improvement. A couple simple ones that just need a few bolts and some Lexan and other's that potentially involve adding an active wheeled intake to it. We have a couple weeks to iterate before our first event, lots of ideas and hopefully enough time to find the one that works the best. Here's the back side of the collector, it's amazing that everything fits. We had to shave down some bolt heads to get the clearances we needed. 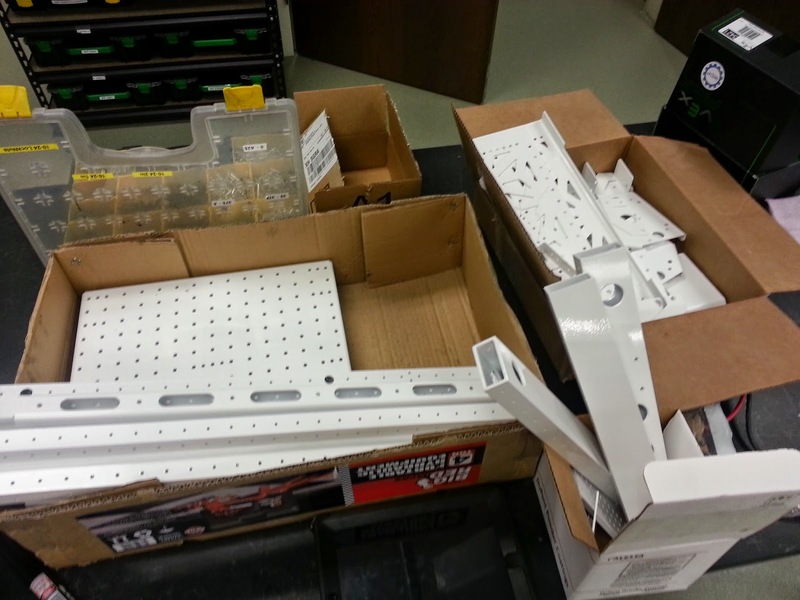 We dropped off the competition robot parts at SABS a rim repair shop here in Houston that will be powder coating for us this year. Always nice to get a new sponsor.